1. A Group Vitamins are a catalyst in hair growth, promoting natural shine and elasticity. Good sources of vitamin A include liver, red peppers, carrots, eggs, sweet potatoes, dark leafy greens (like spinach) and dried apricots. B Group Vitamins can also increase the rate at which hair grows, especially biotin and complex B vitamins, while B3 is known to assist with blood circulation to the scalp. Good sources of vitamin B include nuts, cabbage, eggs, whole grains, kombucha and potatoes. E Group Vitamins possess nutritional qualities associated with hair growth - in some cases, they can be applied directly to the scalp. Sources include vegetable oil, soy beans, tropical fruits and corn. 2. Stop / Reduce Smoking – In contrast to the healthy blood circulation promoted by multivitamins, smoking is known to restrict blood flow to the scalp, consequently reducing hair growth. 3. Iron Helps Us Play – Iron is critical for energy levels as it is very effective in blood circulation. It’s found naturally in hemoglobin, an oxygen-based protein in red blood cells. A 2007 study by L'Oréal found correlations between iron deficiency and hair loss in pre-menopausal women. 4. Drink Lots of Water – Healthy hair shafts should comprise around 25% water, so staying well hydrated will keep them in the best condition possible. 5. Reduce Alcohol Consumption – Alcohol alone is not known to cause hair loss – however, prolonged heavy drinking will exacerbate some types of alopecia. 6. Protein and Hair Belong Together – In fact they are together. 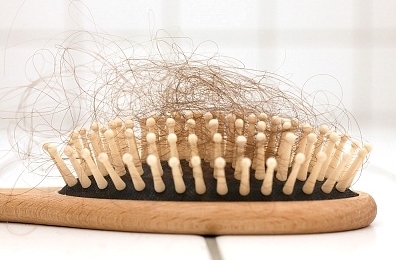 Hair is made up of protein, therefore a protein deficiency can result in hair loss, though this is seen most often when there is no protein at all in the diet. 7. Hair Thickening Shampoo & Conditioners – There are now hair restoration shampoos and conditioners like Samy Hair and Toppik which contain a mixture of protein and keratin (the same stuff your hair’s made of) that bonds with hair follicles through static charges. The result is a thicker-looking head of hair without the need for surgery or medication. 8. Wigs – Ok, I know…but hear me out! The technology behind wig manufacturing has come a long way in recent years - integration wigs, as the name suggests, combine with your own hair to add fullness and length. Lace wigs are made with real human hair or synthetic hair and are usually attached with glue or tape. High-definition wigs have a high level of customised detail, created strand by strand and retailing between $6000 and $25000! 9. Avoid Antiperspirants – Believe it or not, studies have shown that antiperspirants can cause hair loss. This is because they prevent sweating by closing up the sweat glands and pores under your arms. Unfortunately, the sweat still has to get out somewhere and is forced out of your scalp, placing increased stress on hair follicles. Grape seed oil stimulates the hair follicles and helps in hair restoration. It is also good for those with curly hair, as it would make their hair more manageable. It is most growing common problem in people around the world these days. There are several ways to maintain or stop hair loss problem, but I usually try to eat a diet with full of green vegetables and fruits with essential ingredients. Additionally, I always considered some supplements and products that may nourish my hairs.